Home Food Linden Hills Farmers Market: What's the right number of mini-markets? Linden Hills Farmers Market: What's the right number of mini-markets? Downtown Linden Hills was bustling yesterday morning, as brunch-goers waited for tables outside crowded restaurants while older shoppers peered in the windows of Clancy’s butcher shop and younger ones spied on the Wild Rumpus pets. The launch of the latest neighborhood farmers’ market, in the Settergren’s parking lot, drew plenty of visitors from beyond walking distance and created more synergy among the local businesses. Even with two new-ish neighborhood markets in the area, Fulton and Kingfield, south Minneapolis’s demand for mini-markets is clearly strong. Having visited the St. Paul Farmers’ Market the previous day, I was interested in comparing the big market and mini-market experience. 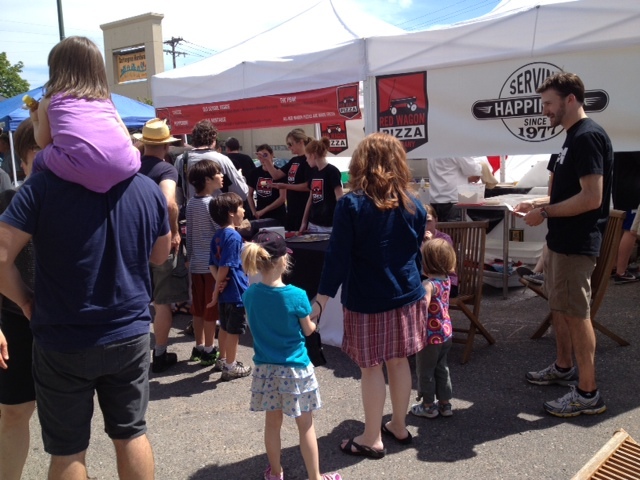 While St. Paul has more vendors and a greater selection of goods, Linden Hills covers most of the bases in terms of raw ingredients—Callister Farm eggs and chicken, Sunrise Flour Mill grains (and pizza dough toss demos! ), Bare Honey’s namesake sweet, Gardens of Eagan plants—and prepared foods—Patisserie 46, Moonshine Coffee, Red Wagon Pizza, etc. Mini-markets offer more opportunity to meet your neighbors, but you’re more likely to bump into friends from all over the metro at the larger ones. Both experiences are great in different ways, so the deciding factor for shoppers will likely be convenience: when I can walk or bike to a neighborhood market, why get in the car and head downtown? But shoppers’ gain may be vendors’ loss, as farmers and food-makers spend more time staffing smaller markets to make the same amount of money, the Pioneer Press reported a few weeks ago. I’ve certainly seen my behavior change: farmers’ market trips to Kingfield, Fulton, and Linden Hills have replaced those to Mill City. But my market trips have also increased in frequency, reducing the amount of produce I buy at the co-ops. Will the rise of mini-markets cannibalize traffic to the larger farmers’ markets, or to the grocery stores? Talkin’ Turkey: Are you Ready for the Big Feast?